Earlier this week, Dazed announced the upcoming 89plus art marathon taking place kicking off this Friday at London's Serpentine Sackler Gallery. Dedicated to mapping out the generation born in or after 1989 (i.e. anyone #YoungerThanRihanna), the multi-platform research project was co-founded by two non-89ers, curator Simon Castets and artist Hans Ulrich Obrist. Today, Dazed can exclusively reveal the winner of the Re Rebaundengo Serpentine Grant for emerging artists. Meet Niko Karamyan (aka Niko the Ikon) and Tierney Finster, creators of video productions sultry enough to knock up an R Kelly B-side. Born in 1992 and 1991 respectively, the American pair won the DIS Magazine-hosted DIScrit 89plus popular vote for the grant, which consists of a €10,000 stipend to support their creative practice and a €5,000 production budget to realize their next project. The grant will go towards expanding "Can We Talk" into a trilogy of music videos for the Re Rebaudengo Serpentine Grant exhibition in Turin, Italy. Inspired by Niko's love for Tevin Campbell's 1993 track, the pair filmed their own interpretation in the mountain setting of Big Bear, California, on Niko's 20th birthday. 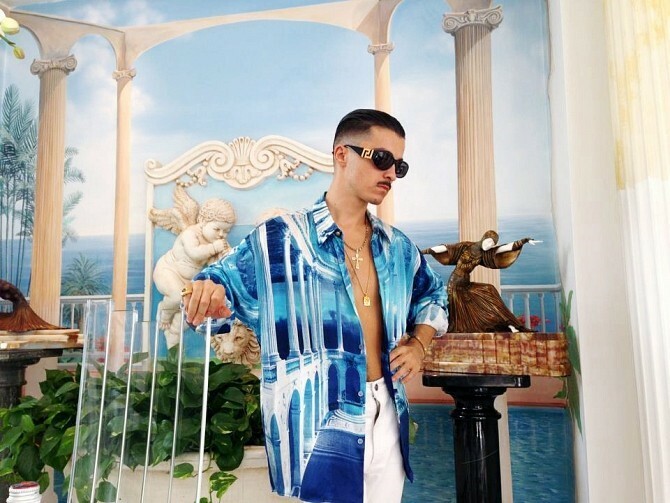 The VHS-filmed video eventually became a slow jam sensation, no doubt aided by the fact that Niko's ski-lodge crooner persona seems like the kind of guy who'd take you out to a candelit dinner and have the jacuzzi running by the time you get back to his. While the video explores the passion between Niko and Tierney's artistic personas, it also constitutes a love affair with the music video itself. Both Tierney and Niko are products of the TRL (Total Request Live) generation, and grew up watching channels like MTV and VH1 before and after school. At a time where your fave video aired on the whims of MTV controllers, where shows like Making the Video provided behind-the-scenes glimpses into the pop star production process, the music video was a high-budget, high-concept happening. When Niko and Tierney finished middle school, on the contrary, the launch of YouTube meant that video on actual demand was a real possibility. Cheap recording technologies meant that you could create your own videos, simultaneously democratizing its reach and diminishing the status of music video itself. "Can We Talk", alongside Niko and Tierney's creative practice, embodies how artists #YoungThanRihanna respond to changes in the dominant culture they grew up with. Jacuzzi included. Niko and Tierney will be present at the 89plus marathon at the Serpentine this weekend, alongside Harry Burke, poet and Dazed writer, rapper LE1F, Crispin Best, another Dazed writer and poet, Amalia Ulman, JOGGING's Brad Troemel, artist Felix Malia and others. Click here for more info - see you there!